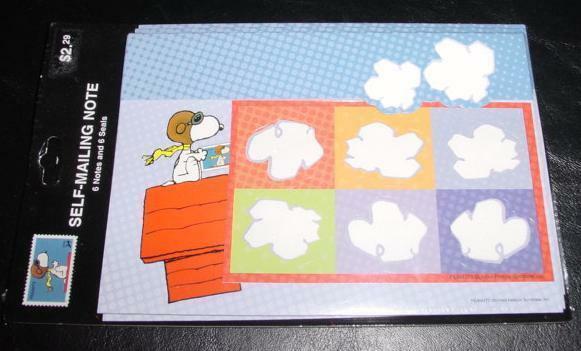 Peanuts Snoopy USPS stamp self-mailing notes 6 notes with 6 seals Snoopy as the Flying Ace holding his postage stamp, flying on top of his doghouse. New in package. Made by Hallmark for USPS. USPS First Class shipping as calculated -- I will combine items purchased within the same week but no longer; Payment by PayPal or Money Order All our items are from a smoke-free, pet-free, child-free home. Payment is expected within 7 days after the close of the transaction. Please email me if you have any questions. Every effort is made to provide complete information about the items being offered. If you have questions, please ask BEFORE you bid/buy. All sales are final.